Mapping public bus transport seems to be the theme of community projects this summer. The French community have announced their project of the month (similar to the UK’s Quarterly Project and Germany’s Wochenaufgaben) for July 2017: Bus Stops. The results are published on the OSM wiki. At the end of the month (July 29th and 30th), OpenStreetMap US is running a summer bus Mapathon, with the objective of field survey of bus stops and bus routes on those two days. OSM Inspector has been updated. This affects the “Geometry”, “Tagging”, “Places” and “Highways” views. Nuno Caldeira explains that the rendering problem on São Jorge island in Azores is solved. He also asks for comments about further clean-up options. At the moment of writing some old “flooded” tiles still appear at some higher zoom levels, but that will get fixed as new tiles are rendered. Clifford Snow initiates a discussion on Talk-us mailing list about a recent case of data being added to OSM for SEO in the US. A company created one account per POI and added the tags of the POI to an existing street. A mapping team from Aoyama Gakuin University mapped emergency facilities (such as AEDs, fire hydrants, etc) in Yamato city. This data was built to be browsable on MAPS.ME. And their results were reported (automatic translation) on a local newspaper. However, on the Japanese mailing list, their tagging manner (name=AED and tourism=information were added on emergency=defibrillator) was criticized (automatic translation) to be “tagging for the renderer”. After a discussion, problematic tags were removed. His justification on that tagging is explained at a changeset discussion. Mapbox writes about the StatCan initiative in collaborating with OSM-Canada to map buildings of Ottawa in OpenStreetMap. MapBox indicates that it support this project. Jennings Anderson wrote about the procedure of creating his “User per Country” statistics maps. OSM Colombia trained 25 local farmers in the region of Anitoquia on how to map with JOSM in cooperation with a “Right to land and territory” group and the PASOColombia Organization. This included people from Nechí, Tarazá, Caucasia, Valdívia, El Bagre and Zaragosa. OSM blog posted a bunch of “Featured Images of the Week” along with the histories behind each of them. Check the wiki to learn how to propose your image of the week! Spanholz has posted a list of OpenStreetMap projects in the reddit linux forum. Jochen Topf states on Talk-CA that there are still numerous “old style” multi-polygons in Canada (ie. tag in both the relation and the external way), a great number resulting from CanVec imports. There is not an important community in Canada and the threat to erase the data was brought a few discussions about the way to collarate with local communities. Kyle Nuttall notifies imports mailing list about Ottawa’s official dataset of over 149,000 city-maintained trees. A lengthy discussion about tagging and verification ensues, and a wiki page lists the import’s current state. Peter Barth reports about the last OSMF Board meeting in Amsterdam (May 2017). SotM 2017 tweeted: Last chance! Nominate a person, a group or an organization for an OpenStreetMap 2017 award (deadline Sunday, July 9th). The deadline to propose sessions for SotM Asia (September 23-24, Kathmandu, Nepal) has been extended to July 15, 2017. The same for scholarships. HOT has launched three formal research experiments on crowdsourced damage assessment. The study aims to better understand which type of data and accuracy is most urgent for post-disaster response, and how to maximise the impact of online volunteers’ contributions. OpenStreetMap Colombia releases the poster “Pre-elimination Malaria in Pacific Coast, Colombia” with the result of the project “Herramientas, formación y redes encaminadas a disminuir la carga por malaria en Colombia”. Best regards to all involved in the #MapatónXGuapi initiative that generated the needed geodata. HOT and Doctors Without Borders (Turkey) organized Turkey’s first Missing Maps mapathon in Istanbul together with volunteers in Kampala to support the many refugees and displaced persons in Uganda in order to better meet their needs. Heather Leson and Guido Pizzini from IFRC organised a Missing Maps workshop for grade 9 students in Ecole Internationale Geneva, and started a discussion about how to involve kids in mapping activities on HOT mailing list. Cyclestreet.net introduced their bikedata map, visualising critical spots in bicycle infrastructure to support campaigns for improving cycling networks. Hartmut Holzgraefe improved GPX upload in MapOSMatic. Until now it was necessary to manually select the upload area, while this update automatically detects the bounding box from the GPX data. There is more news about the service: the support of the veloroad.ru style, a locate-me button in the slippy map and contour lines for the OpenSnowMap style. Just arrived on the instant messaging app Snapchat, the Snap Map location sharing with friends functionality is already controversial. It allows to share its user’s position in real-time and to very precisely locate your friends around you, or track their movements on the other side of the world. Some voices warn parents against a too precise location of their children. The OpenTopoMap now evaluates (automatic translation) a given direction=* tag on viewpoint rendering. A new webservice Printmaps to create large-format, OSM-based maps in print quality is in beta testing. In addition, the display of your own data and map elements are special features of Printmaps. Klaus aka tok-rox asks for feedback. User tyr_asd just published a new layer for his OSM node density visualization tool, and challenges the readers to find out which city is represented in this screenshot. Mapzen presents a second technical preview of OSMLR. It “provides a stable linear-referencing system atop the ever-changing network of roadways in OpenStreetMap. It’s used by the Open Traffic platform to associate statistics like speeds and vehicle counts with roadway segments. And it has many more possible uses, beyond just traffic statistics”. A preview build is also announced. Geoboxers’ WorldBloxer generates Minecraft templates of any place on Earth based on OpenStreetMap data. It’s now in beta. Florian Lainez announces Jungle Bus, a new project for public transport mapping based on OSM Contributor. The app is meant to be very easy to use, in order to facilitate data collection for transport networks mapping. Mapbox announces its new plugin for calculating isochrones, curves that include the areas you can reach in a given time from a starting point. It is able to quickly compute up to 60 minutes isochrones for pedestrians, cyclists and cars. Thomas Skowron publishes the June summary of his work on “Grandine: Vector Tiles”. The introduction was presented on March. The source code is available on GitHub. Mapbox’s latest SDK release for Android and iOS brings in the possibility of 3D map visualisation for mobile devices. The current release status of software around OSM can be found on the OSM software watchlist. … that Critical Maps (an Android and iPhone App for the Critical Mass) uses OSM as background? … the free of charge WebService to create figure ground plans by the geographer? Thus they attract mainly students, architects and engineers. … OSM-Nottingham? It is an example of a website dedicated to providing OSM-based information for both the general public and mappers about a specific local area: the Nottingham conurbation. It provides a mix of layers: rasters, including historical maps, thematic layers using GeoJSON, and searches for OSM data and a wide range of local and national Open Data sources. It is maintained by user will_p. … the amazing keynote by Allan Mustard, U.S. ambassador to Turkmenistan, held in Brussels at SoTM 2016? … that Frank Sellke has collected several photos and information about bridges on his page brueckenweb.de? The maps are based on OpenStreetMap. GIScience Research Group of the Heidelberg University has published the article “Introducing Healthy Routing preferring Green Areas with OpenRouteService”. GIScience News Blog points to the study “Are Crowdsourced Datasets Suitable for Specialized Routing Services? Case Study of OpenStreetMap for Routing of People with Limited Mobility” and gives further insight into the issue and its background. Peter Murray compiled an impressive list of 80 maps, to celebrate the art and power of data visualisation. He grouped them into six broad categories: Conflict Zones; Connectivity; Environmental; Sites, Sounds, and Smells of City Living; Social Media Maps and Transportation. Direction Magazine analyses the emerging trends at the intersection of GIS and aerial imagery, that feature the rise of cloud services and of platforms that allow the exploration of many image sources at once. Before vacation, Guillaume Roche proposes to discover the offline world of MAPS.ME. Smithsonian.com published an article, titled: “From Ptolemy to GPS, the Brief History of Maps” written by Clive Thompson. He reports as well on the island of California, trap streets in London and non existing mountains on a map “drawn up in 1798 by the British cartographer James Rennell and copied throughout most of the 19th century”. 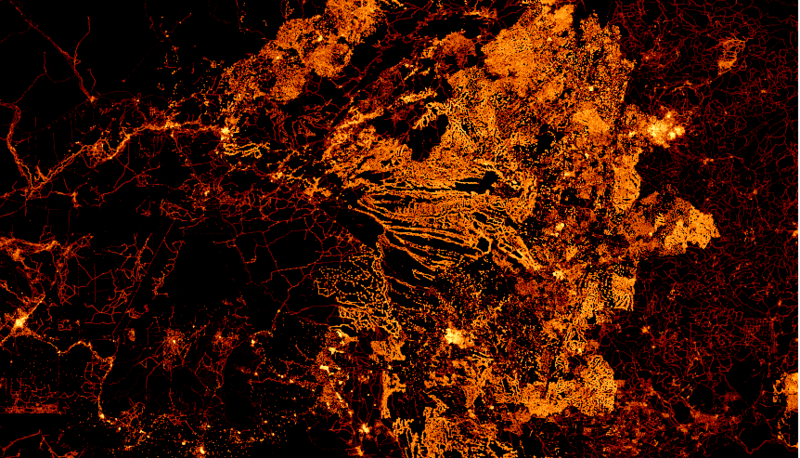 Metrocosm maps show how so much of the world occupies so little of its land. For countries like Australia, Spain, USA, Canada and for North Africa, we see which size of the country is occupied by 50% of the population. For Canada, this is in South Ontario and Quebec near the USA border. Note that this population occupies less than 150,000 km2, 2% of Canada’s surface. Mapbox introduces a new tool, Cartogram. It’s a drag-and-drop tool to create a custom map in seconds. The World Economic Forum shows maps that will change the way you see the world. Surface comparisons of various countries are made. Following an enquiry started in 2007, Brooke Singer created the platform ToxicSites. It includes a map that provides information about pollution in the U.S., aggregating information from several sources. Canada, which has one of the most restrictive drone regulation, just approved a micro drone to his record of Compliant Unmanned Air Systems. This approval could enable better flexibility for flight in restricted areas or past visible line of sight (LoS) and offer more possibilities to surveying and mapping professionals. One example is a drone delivery company who passed successfully the Transport Canada tests for flights beyond visual LoS. This should allow experimental drone deliveries. Spiegel Online published an article about the fastest moving island of the world: Trischen island, which shifts to the east about 30-35 meters per year. OSM Cochabamba reported on Twitter on the way in the “Quebrada del Yuro” and the village of La Higuera, Bolivia, places of the capture and death of Ernesto Che Guevara are now included in OSM as well. This weeklyOSM was produced by Anne Ghisla, Nakaner, Peda, PierZen, Polyglot, SK53, SomeoneElse, Spec80, TheFive, derFred, jinalfoflia, keithonearth, kreuzschnabel, muramototomoya. The “OSM software watchlist” url ( https://wambachers-osm.website/index.php/osm-software ) returns 404.